Note : Then Change the Drive Letter C,D,E,F,G….and repaeat the Same Process..
Autorun Eater was born due to increase of malwares using the ‘autorun.inf’ tactic to infect users unknowingly be it from flash drives, removable hard disks or any other removable storage device. Hi this Problem Occurs to you bcoz of the Presence of “AUTORUN.INF” Virus. So remove this Virus by following anyone of the above 3 Steps. Download Autorun Eater 2.2 from this site to remove this Virus.. I have Avira installed, and several antispyware tools, and none of them was able to eliminate this crap (how is this posible?). But now, with the .bat file method it has gone. Thanks a lot. Now a days almost all Antivirus Removes this Autorun.inf Virus. Try to use the BEST antivirus and Spyware. nice !! its was extremely useful !! than go to properties of autorun.inf and uncheck read-only box. 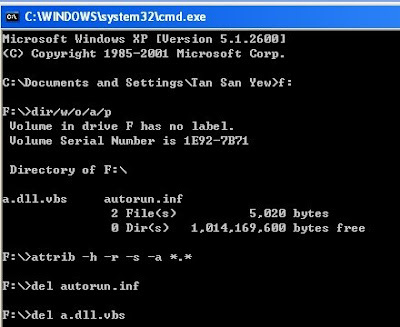 i faced autorun.inf . i used to the anti virus and antispyre. but i faced virus. and this Eset nod32 antivirus daily daily updated. so what am doing? please tell me the answer……….. Thanks Praveen…… Good Tips ..
my name is also praveen ….